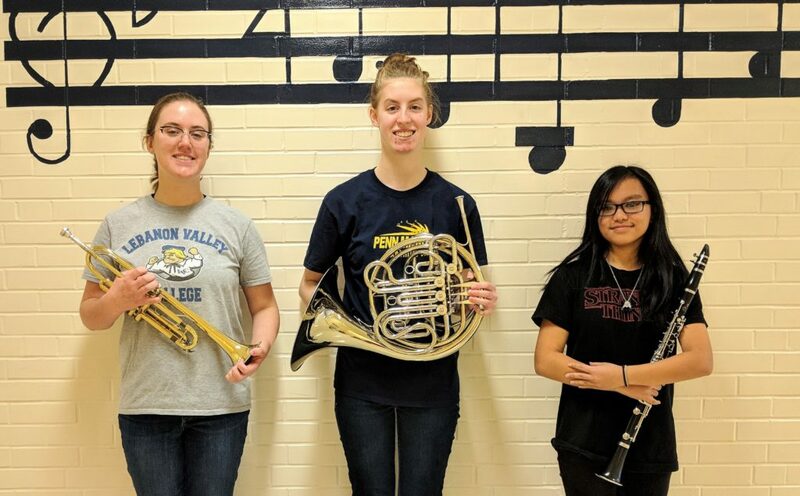 Congratulations to Penn Manor High School students Julia Young, Elise Thyrum and Hannah Stork, who were named to District 7 Band and Orchestra. Seniors Elise (horn) and Julia (trumpet) and sophomore Hannah (clarinet) were named to District Band and will participate in the District 7 Lower Band Festival Jan. 25 and 26 at Lancaster Mennonite High School. They will perform in concert at 7 p.m. Jan. 26. Julia also was named to District 7 Orchestra and will participate in the Orchestra Festival Jan. 10 to 12 at Central Dauphin High School. She will perform in concert at 7 p.m. Jan. 12. The students were selected to participate based on auditions that included other students from Lancaster, Lebanon, Adams, Cumberland, Dauphin, Franklin, Perry and York County schools. Julia had a particularly strong audition, placing second out of 46 students playing trumpet. Way to represent Penn Manor, ladies! From left, Julia Young, Elise Thyrum and Hannah Stork.